Tommy Caldwell on Yabo Problem. Yosemite has over 700 documented boulder problems and more are discovered ever week. 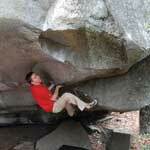 Below is a listing of almost all the major bouldering areas. Learn general info on Yosemite Valley  where to stay, how to get there, maps, etc..